The horn faces on the axleboxes are being machined in preparation for the welding on of the manganese liners. Welding has begun. The axleboxes for the centre axle are the first to be tackled. 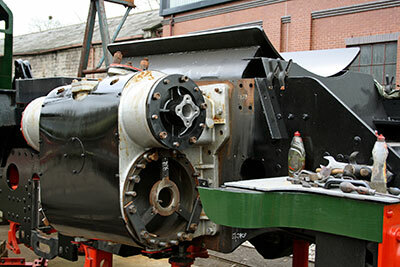 Work on the smokebox door has proceeded quite quickly in recent weeks and is virtually complete now. This will now lead towards fitting the front ring into the wrapper, reaming the already drilled holes and riveting the two together. Once the assembly appears sitting on the saddle there will be a lot of drilling through the base of the wrapper and into the saddle in preparation for the bolts to hold the structure together. The vacuum chamber release valve has been machined in house and an extension bar is under construction for reaming the cylinder mounting bolts from the opposite side of the chassis with the magnetic base drill. 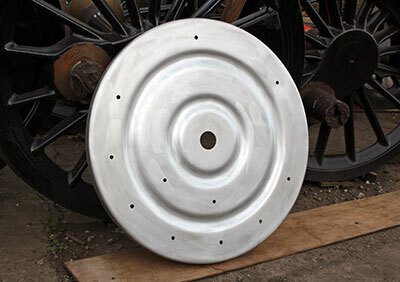 The rear steam chest covers are in the course of manufacture at The Boro’ Foundry as are the pivot slide and top frame for the front pony truck. The window frames for the cab weather boards are in the course of manufacture and we are very grateful to Philip Oldfield for his help with this job. A new dedicated fund is to be set up later this year with the aim of raising continued funding for 82045 after the new loco has entered service. The Trust is determined that the future of the locomotive should be secure, and we intend to continue with our policy of remaining financially independent for as long as we possibly can: the last thing any of us wants is to see 82045 sidelined and a static exhibit in the Engine House for years, as has been the fate of several other much-loved members of the SVR's steam fleet. 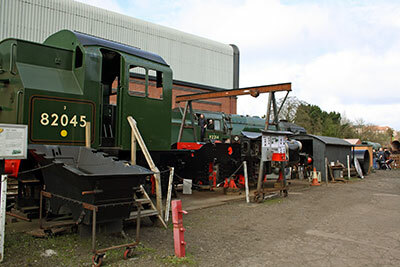 The Future Fund will have its own bank account, and we hope in this way to ensure that the money will always be available to pay for running repairs and overhauls. The engine should give years of good service when completed, and we want to be sure that down-time is kept to a minimum. Chris has said that he will look after the account until he's in his dotage (no rude comments, please!). The Fund will be officially launched on the occasion of our memorial train for Paul Anderson, Waterloo Sunset, on 6th October, (details in the February notes) but if you approve of the idea, do please feel free to get in touch with Chris in the meantime. Yes, it's almost upon us again. 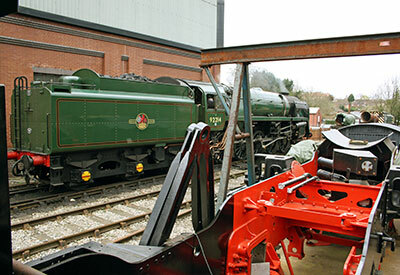 The meeting starts at 2:00pm, Saturday 8th April, in the upstairs Lecture Room at Kidderminster Railway Museum and we look forward to seeing you there. All positive comments and suggestions will be welcome, and you don't have to be a member to attend, though voting on any issue discussed is restricted to members of the Trust. The Museum, for those of you who don't know it, is well worth a visit in its own right and also has a pleasant café downstairs, where you can buy drinks (of the non-alcoholic variety) as well as a range of sandwiches, toasties and cakes or an excellent bowl of chilli con carne. 82045 Raffle - win this Gordon Barnes painting! 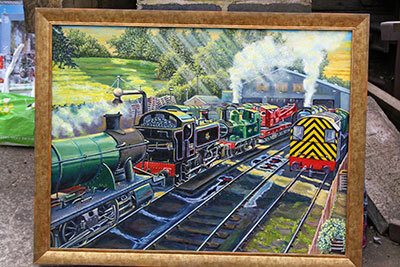 Gordon Barnes has kindly donated this oil painting, which was featured recently in local newspapers, to The 82045 Steam Locomotive Trust to help finance our new build engine. If you fancy your chances please send your name/address/telephone number and a stamped addressed envelope with your cheque to Barbara who will send your tickets to you. Tickets are £1.00 each and the draw will be held at the Open House Weekend on Sunday 9th April 2017. The winner will be notified by telephone as soon as possible after the draw. The front steam chest cover in place on the right hand cylinder, but without the dummy for the valve spindle extension. Photo: Tony Massau. 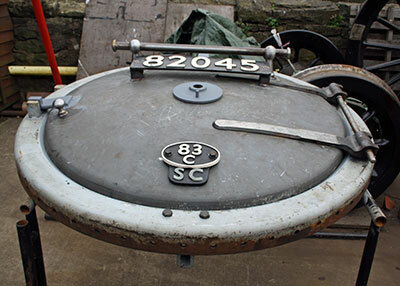 The virtually complete smokebox door. Photo: Tony Massau. The inner liner for the smokebox door. Photo: Tony Massau. 82045 Raffle. Win this Gordon Barnes painting!